Posted 8/9/2018 9:34pm by Leslie Cooperband or Wes Jarrell. By mid-August, the windows of opportunity to make drastic changes to the farm have started to close. The waning days of summer are no time to shift course or add another enterprise on top of those in play. No, this is the time of maintaining, of resigning oneself to let go of the possible and nurture the actual. The heat and drying soils make late summer plantings of fall greens and carrots a challenge. The lack of fruit set on the fava beans forebodes a paltry harvest. The invasion of Colorado potato beetles on our late-planted potatoes suggests fewer potatoes to be dug in a few weeks. There’s a sense of urgency to harvest the crops at hand and preserve what we’ve got. There are resignations to embrace the abundance of beets and pickling cucumbers and stop fretting over green tomatoes not turning colors. The lushness of the pasture is fleeting as well. We struggle to keep the does in front of high quality pasture and browse to keep their milk production from tanking. We become obsessed with giving them opportunities to keep their heads buried and their mouths munching. Every quarter inch on the measuring stick in the bulk tank is either small victory or back set. There’s a gradual shift in the mindset of managing the farm and the land in mid- August. Farming overall is a constant tug of war between thinking you can manage everything to realizing you can manage only a few things, and sometimes the farm manages you. Although the tropical breezes still blow, the days are imperceptibly shorter, and you know that peak of abundance has crested. It’s best to embrace it; give in to the change. This week’s text club special relates to gelato. To get the message with the special info, you’ll need to sign up: text either “GOAT” or “URBANA” or “FARMSTORE” to 30500 to sign up. This Saturday’s forecast for Urbana is warm and sunny. Come early to the market to get your weekly fare of locally-grown goodness and beat the crowds. The market is brimming with summer bounty-peaches, melons, sweet corn, tomatoes, eggplants, berries, and lots of delicious goat dairy products from yours truly. Feta is still on summer vacation, but will be back in the line-up next weekend. Malted Moonglo: how about a little beer in your cheese? We made an experimental wheel of Moonglo with beer added to the curds before they were pressed into the molds. The cheese has a slightly sweet, malty character. We think it’s delicious. We’ve been making lots of gelato and fruit-based sorbettos with all the great local ingredients we have available at this time. We also made a very special (and limited) batch of Pistachio gelato (pure Sicilian pistachio paste). This is a premium flavor @ $12/pint. I encourage you to bring a cooler with ice packs to the market to keep your gelato in tip top shape as you travel from the market to your home. Remember: $10/pint or 3 for $27 (except for pistachio). Now through the end of August, we are open Wednesdays-Fridays, 3-7 pm, as well as Saturdays and Sundays, 1-4 pm. The farm is beautiful this time of year—lush with plant and animal life alike. Come out after work to unwind. During our open hours, you can savor a scoop of gelato or “build your own” cheese boards—pick out your cheeses, add a stick of salami (Underground Meats) or a jar of jam from Autumn Berry Inspired or pickled veggies, grab some Lucky Pierre bagel chips or Central IL Bake-house baguette bread and we’ll provide the board. You can sit outside under our new pavilion roof and enjoy a glass of wine or beer with cheese! Want to go the total sweet route? How about a root-beer float with a scoop of our gelato? Need to de-stress? Come visit with the goats. They love to be petted, even in the warm weather. Shop in our farm store: “The Real Stand.” We’ve got pasture-raised meats and poultry from Bane Family Meats, frozen artisan sausages from Piemonte Sausage Co., pickled veggies and pesto by Sarah (our former gelato maker), locally-grown and milled flours by The Mill at Janie’s Farm and much more. Back in the store this week: goat milk yogurt by Green Meadows Farm and end of summer sweet corn from Babb Farm. Farm Dinners: Fall season is not far away, and the September and October farm dinners are filling up fast. I encourage you to book your tickets now. We have two versions of our 100 Yard Dinner this year: a progressive meal around the farm in mid-September and “Ploughman’s Feast” style meal in October; menus forthcoming. We will be adding a couple of other special dinners this fall too (a beer dinner with Half Acre Brewery on October 6th for sure). CU Symphony Orchestra to perform special “environmental” pieces on our farm on Sunday September 23rd, 2-4 pm. Visit Prairie Fruits Farm & Creamery for a free gelato social and concert from 2:00 to 4:00 pm on Sunday, September 23 to celebrate Mother Earth's summer harvest! This tribute to our planet will feature musicians from the Champaign-Urbana Symphony Orchestra performing several earth-themed chamber works by CUSO Composer-in-Residence Stacy Garrop. PFFC owners Wes Jarrell and Leslie Cooperband will bring us the latest news about their sustainability efforts on the farm. Take a tour of the farm, visit the goats, and participate in our "Messages to Gaia" community art project--where you can draw pictures, write poetry or simply share your thoughts about our planet. Come enjoy! This event is sponsored by CUSO, New Music USA, and Prairie Fruit Farms & Creamery. Posted 8/2/2018 9:56pm by Leslie Cooperband or Wes Jarrell. September in July; days not even breaking a sweat over 80, nights dipping below 60; there has been a strange crispness to the air of mid-summer. The need for a sweatshirt to do the morning chores felt out of place. The quiet air of the barns without fans seemed almost decadent. The sudden drop in temperatures was a welcome respite from the previous weeks of extreme heat and humidity. 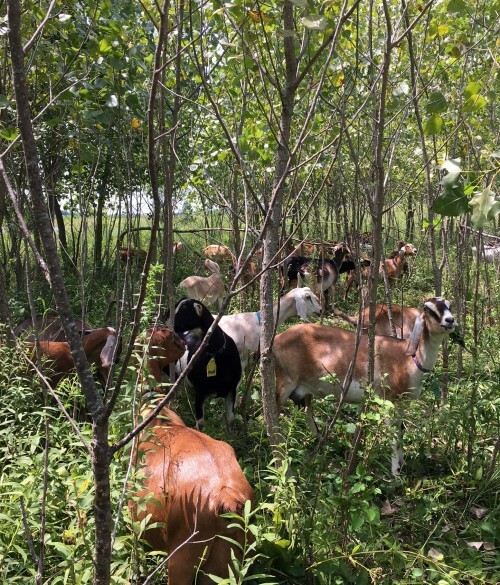 While the farmers were rejoicing, the goats were taking environmental cues. Sudden changes in temperature stirred their dormant breeding hormones into action. When they start cycling into heat, they exhibit a few telltale signs. Like a bunch of high school girls with too much time between classes, their cliquishness becomes accentuated. Small groups pick fights with a doe close to their rank in the dominance hierarchy. Others decide to engage in one-on-one tete-a-tete girl spats. Some of the does’ udders become so sensitive they jump when you try to put the milking inflations on them. Others wail on their way out to the pasture as they pass by the paddock with the breeding bucks. Their milk production suffers a bit too, as their resources are reallocated to other priorities. We need them to keep their milk production up. We are nowhere near ready for them to put their minds on procreation. The forecasting return to summer temperatures is bittersweet. 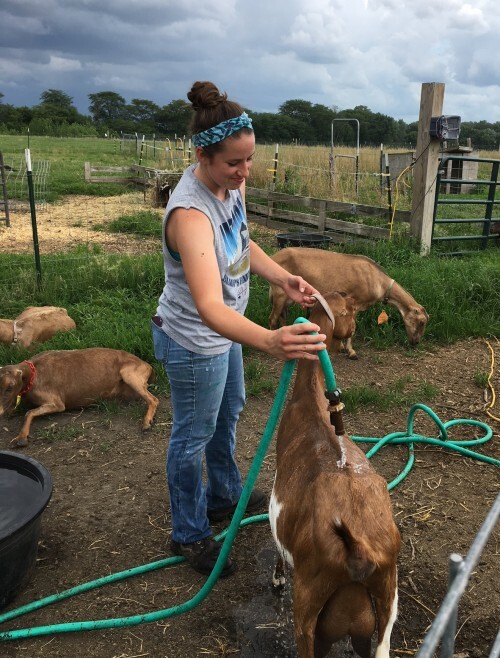 The farmers will sweat, but the goats will return to more “normal” summer pursuits: eating pasture and making milk. Text Message Customer Loyalty Program: This week’s text club special relates to huckleberry blue. To get the message with the special info, you’ll need to sign up: text either “GOAT” or “URBANA” or “FARMSTORE” to 30500 to sign up. Little Bloom on the Prairie: This batch is perfectly ripe, bordering on gooey this weekend. Nice delicate rind with hints of mushroom. Black Goat: an ash-coated bloomy with a delicate and crinkly yeasty rind. This batch is perfectly ripe, and it has a sublime fudgy almost gooey consistency, a slight goat tang and a hint of yeastiness on the rind. Moonglo: fall-milk, tomme-style cheese; the texture of this semi-hard cheese is soft and supple like Gouda, but the taste is sharp and fruity. Ask for a taste if you’ve never had it before. Try melting it for a gourmet grilled cheese. Gelato: We’ve got a good quantity of with gelato and sorbetto this week. I encourage you to bring a cooler with ice packs to the market to keep your gelato in tip top shape as you travel from the market to your home. Now through the end of August, we are open Wednesdays-Fridays, 3-7 pm, as well as Saturdays and Sundays, 1-4 pm. The farm is a tranquil green space where you can come after work to unwind. During our open hours, you can savor a scoop of gelato or “build your own” cheese boards—pick out your cheeses, add a stick of salami (Underground Meats) or a jar of jam from Autumn Berry Inspired or pickled veggies, grab some Lucky Pierre bagel chips or baguette bread and we’ll provide the board. You can sit outside under our new pavilion roof and enjoy a glass of wine or beer with cheese! We have lots of shades spots in the grass too. Want to go the total sweet route? How about a root-beer float with a scoop of our gelato? Need to de-stress? Come visit with the goats. They love to be petted, even in the warm weather. Shop in our farm store: “The Real Stand.” We’ve got pasture-raised meats and poultry from Bane Family Meats, frozen artisan sausages from Piemonte Sausage Co., pickled veggies and pesto by Sarah (our former gelato maker), locally-grown and milled flours by The Mill at Janie’s Farm and much more. Next week, we'll be bringing back goat milk yogurt by Green Meadow Farm in Arthur. Look for it in our store fridge starting next Wednesday, August, 8th. NEW in the Store! Fresh sweet corn from Babb Farms. Their corn is tender and sweet, and ready for your grill or stock pot. U-PICK: We were picked clean on peaches last weekend. So, U-picking is suspended until further notice. We have a few seats left for our “Summer Vegetarian” farm dinner on August 18th (just 3-4 tickets remain). The menu is on our website and it’s fantastic; I encourage you to book your tickets now. The farm is gorgeous in the summer, there usually is a breeze and it’s a magical place to enjoy a hyper-local farm-to-table meal. While you’re on our website, check out the themes and dates for the fall. We have two versions of our 100 Yard Dinner this year: a progressive meal around the farm in mid-September and “ploughman’s feast” style meal in October. Back by Popular Demand (by ME! ): Night of the Living Farm Tuesday, August 28th 7:30 or 8:00 pm start time (will depend on sunset) Join entomologists Dr. Michael Jeffords, Susan Post, and Dr. Joe Spencer from the Illinois Natural History Survey, for a unique exploration of the insects and other creatures that call Prairie Fruits Farm home. As the skies darken, Michael will give a short program on creatures of the night, followed by black-lighting to attract insects from the surrounding landscape. Insects from mayflies to moths are likely to make an appearance. CU Symphony Orchestra to perform special “environmental” pieces on our farm on Sunday September 23rd, 2-4 pm. Their composer in residence, Stacy Garrop, wrote these pieces to celebrate “Gaia,” mother earth. Details to follow; for now, save the date. Posted 7/27/2018 12:29pm by Leslie Cooperband or Wes Jarrell. The folks from Half Acre Brewery in Chicago paid us a visit yesterday. They already knew that chees and beer play well together as food and beverage, but they did not expect to get intimate with the microbes and the milk. After touring the creamery, we laid out a panorama of cheese “experiments” to share with them. From adding beer to curds to washing or soaking cheese in beer and wine, we had a lot to taste and stories to tell. For those whose livelihoods revolve around fermentation, it is easy to dive deep into discussions about cheese microbes and beer microbes and how they might interact. Do they compete? Does one group provide a favorable environment for the others to thrive? Which flavors will predominate over time? What about those funky chemical compounds in the hops? How do cheese styles affect the microbial ecology? It is always enlightening for us to bring experienced palates to expand our own sensory awareness. Like two cultures derived from the same mother tongue, we rejoice in the common denominators of our respective crafts and marvel at the differences. The culmination of the visit occurred when it was time to pour the coffee stout beer (“Big Hugs”) into the cultured & renneted milk. We had only tried this on a very small scale batch, so not even the cheese makers quite knew what to expect in full vat of milk. We explained the process of milk’s conversion from liquid to gel once the rennet is added (technically called ‘flocculation’), and they stared patiently over the quieted milk for several minutes to watch the spinning stop and the milk begin its transformation to curd; yet another magic trick up the cheese maker’s sleeve. As I bid farewell to our brewery friends (after their goat petting therapy session), my next set of visitors pulled into the driveway in a yellow school bus—nearly 20 7-10 year-old city boys. They spilled out of the bus stairs with the exuberance of kids who had been sitting for way too long. My plans to give them our standard guided tour gave way to realization that these kids just needed to play with our “kids.” So, after a very brief intro to the farm, peppered with lots of questions about the dogs, the chickens, the peaches and the flies, we trotted off to the kid barn. The children exchanged initial introductions with a few goat kids through the fence, and then I let several kids inside the pens with the goats. Initially, I metered the child to goat kid ratio, but after they discovered the doorway to the outside goat “jungle gym,” I threw caution to the wind, and let all the children in with the goat kids. The similarities overwhelmed the differences; both our kids and their kids ran back and forth between the inside pen and outside play structures, both kids and kids yelled with a mixture of excitement and fear. The city kids forgot about the flies and the goat poop and the smells. The goat kids chased the city kids and vice versa. Several of the children would update me on who was their favorite goat or their new best friend. A couple of the goat kids would return to the pen and look to me for reassurance. With their time on the farm drawing to a close, the city kids left the goat pen reluctantly. The power of youth and play is universal and crosses the arbitrary boundaries of species. Text Message Customer Loyalty Program: This week’s text club special relates to fresh ricotta. To get the message with the special info, you’ll need to sign up: text either “GOAT” or “URBANA” or “FARMSTORE” to 30500 to sign up. Fresh, whole milk ricotta: our last of the season ricotta is amazing with grilled stone fruit and a drizzle of honey or your favorite balsamic reduction. We made a lot, but it will go fast. Come early to get as much as you want. Goat Milk Feta: Summer is “feta season!” We make our feta with pasteurized milk and age it in whey brine, imparting all the wonderful complex flavors you’ve come to expect from our feta. Applewood Smoked Moonglo: our friends at Urbana’s Black Dog Smoke and Ale House cold-smoked our Moonglo cheese over Applewood chips; the result is a lovely smokey version of our Moonglo. Like our regular Moonglo, it makes a killer grilled cheese (that’s what Black Dog is doing with it at their Urbana location!). INTRODUCING a new cheese: “Blushing Goat” This little washed rind cheese is bathed in wash of kombucha beer for a little over one month. The result is a vibrant rind, slightly sweet & salty paste with a hint of beer on the finish. Try a slice on a baguette drizzled with honey OR a perfectly sliced heirloom tomato drizzled with olive oil. LIMITED AVAILABILITY THIS WEEK. Now through the end of August, we are open Wednesdays-Fridays, 3-7 pm, as well as Saturdays and Sundays, 1-4 pm. The farm is a tranquil green space where you can come after work to unwind. During our open hours, you can savor a scoop of gelato or “build your own” cheese boards—pick out your cheeses, add a stick of salami (Underground Meats) or a jar of jam from Autumn Berry Inspired or pickled veggies, grab some Lucky Pierre bagel chips and we’ll provide the board. You can sit outside under our new pavilion roof and enjoy a glass of wine or beer with cheese! We have lots of shades spots in the grass too. Want to go the total sweet route? How about a root-beer float with a scoop of our gelato? Need to de-stress? Come visit with the goats. They love to be petted, even in the warm weather. Shop in our farm store: “The Real Stand.” We’ve got pasture-raised meats and poultry from Bane Family Meats, frozen artisan sausages from Piemonte Sausage Co., pickled veggies and pestos by Sarah (our former gelato maker), locally-grown and milled flours by The Mill at Janie’s Farm and much more. NEW in the Store! Fresh sweet corn from Babb Farms. 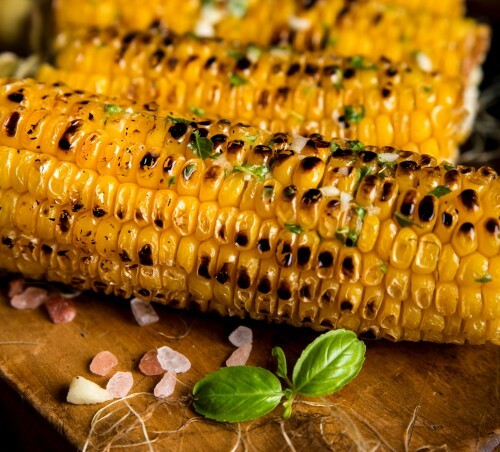 Their corn is tender and sweet, and ready for your grill or stock pot. Try it Mexican style with a chipotle mayo and crumbled feta cheese. U-PICK: We have enough peaches to offer some U-pick opportunities this weekend. You can come out to the farm during our regular farm store hours, and we’ll show you where to pick. We have a few seats left for our “Summer Vegetarian” farm dinner on August 18th. The menu is on our website; I encourage you to book your tickets now. The farm is gorgeous in the summer, there usually is a breeze and it’s a magical place to enjoy a hyper-local farm-to-table meal. While you’re on our website, check out the themes and dates for the fall. We have two versions of our 100 Yard Dinner this year: a progressive meal around the farm in mid-September and “ploughman’s feast” style meal in October. Back by Popular Demand (by ME! ): Night of the Living Farm Tuesday, August 28th 7:30 or 8:00 pm start time (will depend on sunset) Join entomologists Dr. Michael Jeffords, Susan Post, and Dr. Joe Spencer from the Illinois Natural History Survey, for a unique exploration of the insects and other creatures that call Prairie Fruits Farm home. Posted 7/19/2018 9:44pm by Leslie Cooperband or Wes Jarrell. As we took stock of the fruit set and the sizing of the peaches a couple of weeks ago, it was hard to hold down the disappointment. Our Red Havens, usually flush with pinking peaches, barely had any fruits. Our Harrow’s Beauty, another robust variety with soft-ball sized peaches, had none. 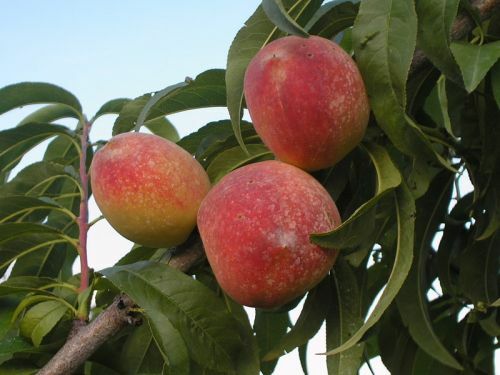 The Reliance (aptly named) have a respectable crop, as do the Belle of Georgia (a later ripening white variety). Text Message Customer Loyalty Program: Given that we basically got rained out at the market last week, I am running the gelato special again for our text fans. To get the message with the special info, you’ll need to sign up: text either “GOAT” or “URBANA” or “FARMSTORE” to 30500 to sign up. This Saturday’s forecast for Urbana is cool (relatively speaking), with a slight chance of showers. Let’s hope the second part of the forecast holds off for the morning. Even if we get a little of the wet stuff, just don your raincoat or carry an umbrella. The silver lining to those cloudy skies is that you won’t have to wait in long lines to get all that peak of the summer produce! Goat Milk Feta: Summer is “feta season!” We are now making our feta with pasteurized milk. It’s still aged in whey brine, imparting all the wonderful complex flavors you’ve come to expect from our feta. Angel Food: our little “mini-brie” or crottin style bloomy rind; this batch of Angel Food is still young, but has nice flavor. It could be sliced into rounds, lightly breaded and pan-fried for topping a bed of fresh greens. Black Goat: an ash-coated bloomy with a delicate and crinkly yeasty rind. This batch is perfectly ripe, and it has a sublime fudgy consistency, a slight goat tang and a hint of yeastiness on the rind. INTRODUCING a new cheese: “Blushing Goat” This little washed rind cheese is bathed in wash of kombucha beer for a little over one month. The result is a vibrant rind, slightly sweet & salty paste with a hint of beer on the finish. Try a slice on a baguette drizzled with honey OR a perfectly sliced heirloom tomato drizzled with olive oil. Farm Store Summer Hours Now through the end of August, we are open Wednesdays-Fridays, 3-7 pm, as well as Saturdays and Sundays, 1-4 pm. The farm is a tranquil green space where you can come after work to unwind. During our open hours, you can savor a scoop of gelato or “build your own” cheese boards—pick out your cheeses, add a stick of salami (Underground Meats) or a jar of jam from Autumn Berry Inspired or pickled veggies, grab some Lucky Pierre bagel chips and we’ll provide the board. You can sit outside under our new pavilion roof and enjoy a glass of wine or beer with cheese! We have lots of shades spots to get you out of the hot sun. Want to go the total sweet route? How about a root-beer float with a scoop of our gelato? Farm Dinners: Believe it or not, we still have a few seats left for our “Southern Style Seafood Boil” and our “Summer Vegetarian” farm dinners. The menus are posted on our website; I encourage you to book your tickets now. To sweeten the pot (the boiling pot that is), we're teaming up with Moon Grove Farm (a new farm B&B) to offer out-of-town guests special rates for the July 21st Farm Dinner. Check out their deals. The farm is gorgeous in the summer, there usually is a breeze and it’s a magical place to enjoy a hyper-local farm-to-table meal. Join entomologists Dr. Michael Jeffords, Susan Post, and Dr. Joe Spencer from the Illinois Natural History Survey, for a unique exploration of the insects and other creatures that call Prairie Fruits Farm home. As the skies darken, Michael will give a short program on creatures of the night, followed by black-lighting to attract insects from the surrounding landscape. Insects from mayflies to moths are likely to make an appearance. As soon as the sky is sufficiently dark, we will explore the surrounding forest and prairie with miniature spotlights to see and experience Arthropod activity seldom witnessed. Everything from giant wolf spiders to munching caterpillars to charming tree frogs will likely appear in our flashing beams. We will charge a nominal fee of $10/person (includes a scoop of gelato). We will be creating an event page on Facebook and a registration page. For now, just save the date. Posted 7/12/2018 10:36pm by Leslie Cooperband or Wes Jarrell. The little savannah to the north of our log house has a fair number of dead or dying trees in it. Some died from old age; others succumbed to frequent standing water. The birds had taken advantage of the rotting trunks and limbs for some time now; feasting on the insect larvae that hide beneath the flaking bark, and making nests in the hollowed out cavities. As much as we have loved providing habitat for mostly vagrant starlings, cow birds and house sparrows (not really), we finally decided to cut these dead trees down. In the past, the highest use for dead trees on our property has been fire wood. 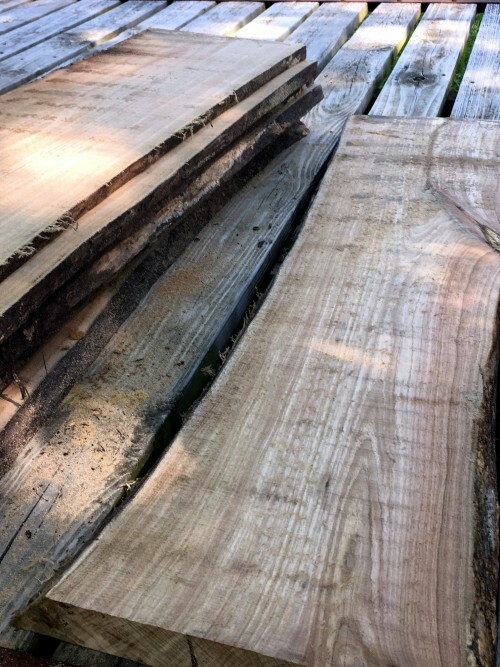 This year, with a number of the deceased being cherry, walnut and maple, we decided to hire in a professional sawyer, a guy with a cowboy hat who comes to the farm with a portable saw mill. He showed up bright and early on one of the hottest days of the week, and set up his mill in short order. 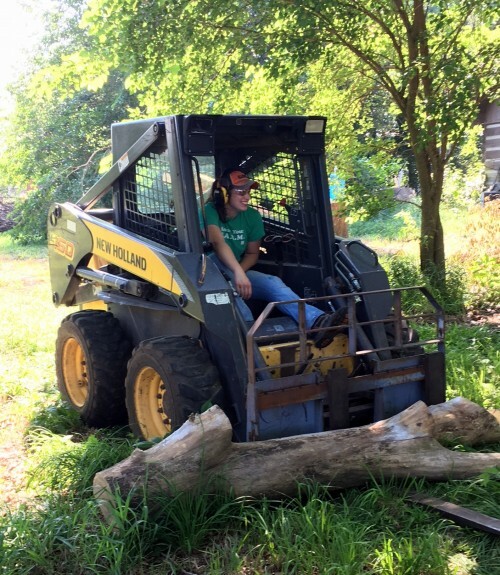 Erica hauled the logs to the mill deftly with the skid steer, while Wes and Erica’s dad (he had to get in on the latest crazy scheme at Prairie Fruits Farm) help to hoist the logs on the feeder belt of the mill. The sawyer, operating the levers as if they were his hands, maneuvered the log with enviable dexterity to position the saw blade to cut exactly how he wanted it. 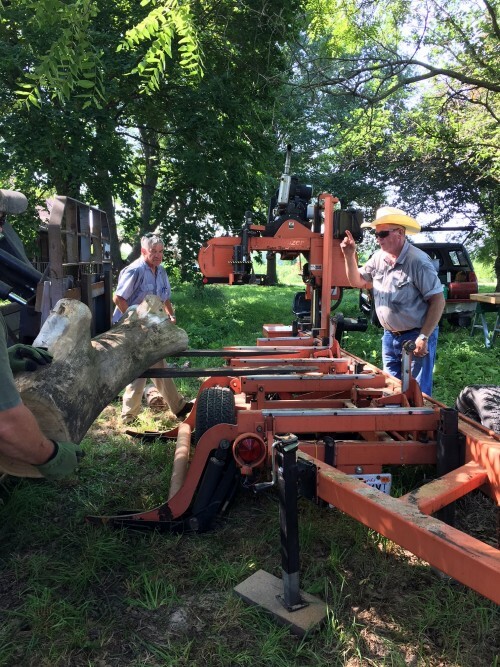 He first had to trim off the limb knobs off the main trunk so the log would be level. Then, he would flip the log onto the flat side so he could cut the planks into perfect slabs. By mid-afternoon, we had a wagon-full of beautifully grained and somewhat oddly shaped planks of wood. We’ve grown or raised a lot of quirky things over the years at Prairie Fruits Farm; josta-berries, marion berries, wheat, guinea fowl and Muscovy ducks to name a few. Here on the prairie, while I’ve treasured our little shaded haven of savannah, I never would have dreamed that we would derive another product from it. We can now add timber to our repertoire. I can’t wait to see the beautiful grains in the wood when we slather on some mineral oil. Text Message Customer Loyalty Program: This week’s market special involves gelato. To get the message with the special info, you’ll need to sign up: text either “GOAT” or “URBANA” or “FARMSTORE” to 30500 to sign up. I know that many folks are reluctant to cook elaborate meals in the heat of summer. That’s why I recommend a simple meal of cheese and accompaniments. The beauty of this approach is that you can mix and match cheeses with assorted jams, honeys, salamis, hams, pickled or raw veggies and fresh fruit. Add your favorite beer, wine or iced tea, and your meal is complete. Most of our cheeses work well with a simple salad too—fresh greens or an heirloom tomato medley. Fresh chevre: plain, herbs de Provence, cracked pepper—so versatile, so delicious. Put it on or in everything you can find from the market this weekend. Goat Milk Feta: Summer is “feta season!” We are now making our feta with pasteurized milk. It’s still aged in whey brine, imparting all the wonderful complex flavors you’ve come to expect from our feta. With the arrival of the first sweet corn, creamy-crumbly feta is in order. I make a chipotle mayo, slather that on my roasted sweet corn, crumble some feta, roll the cob in the cheese and finish with a squeeze of fresh lime juice. Trust me! Little Bloom on the Prairie: This batch is perfectly ripe, bordering on gooey this weekend. Try grilling it for a few minutes. Then, serve with a local honey or a tart jam. Angel Food: our little “mini-brie” or crottin style bloomy rind; this batch of Angel Food is very young. It could be sliced into rounds, lightly breaded and pan-fried for topping a bed of fresh greens. Black Goat: an ash-coated bloomy with a delicate and crinkly yeasty rind. This batch is ripening nicely, and it has a sublime fudgy consistency, a slight goat tang and a hint of yeastiness on the rind. Try pairing with spicy dry-cured salami or a local honey. Gelato: We’re flush with gelato this week. I encourage you to bring a cooler with ice packs to the market to keep your gelato in tip top shape as you travel from the market to your home. Now through the end of August, we are open Wednesdays-Fridays, 3-7 pm, as well as Saturdays and Sundays, 1-4 pm. The farm is a tranquil green space where you can come after work to unwind. During our open hours, you can savor a scoop of gelato or “build your own” cheese boards—pick out your cheeses, add a salami (Underground Meats) or jar of jam from Autumn Berry Inspired or pickled veggies, grab some Lucky Pierre bagel chips and we’ll provide the board. You can sit outside under our new pavilion roof and enjoy a glass of wine or beer with cheese! We have lots of shades spots to get you out of the hot sun. Want to go the total sweet route? How about a root-beer float with a scoop of our gelato? Need to de-stress? Come visit with the goats. They love to be petted, even in the warm weather. Shop in our farm store “The Real Stand.” We’ve got pasture-raised meats and poultry from Bane Family Meats, frozen artisan sausages from Piemonte Sausage Co., pickled veggies and pestos by Sarah (our former gelato maker), locally-grown and milled flours by The Mill at Janie’s Farm and much more. NEW in the Store! Fresh sweet corn from Babb Farms. Their corn is tender and sweet, and ready for your grill or stock pot. As I mentioned in my description of feta above—this combo is a MUST! Our peaches are finally starting to color, so U-pick is not too far off. Stay tuned. Saturday July 14th, 5-7 pm Delight Flower Farm Open House and Guided Tours Delight Flower Farm rents land from us, and they are opening their space up to show folks all the beautiful flowers they are growing. Reservations required. We are keeping our farm store open that night so visitors can shop in our farm store or grab a cheese board and a glass of wine or beer. There are still plenty of seats for our “Southern Style Seafood Boil” and our “Summer Vegetarian” farm dinners. The menus are posted on our website, so I encourage you to book your tickets now, before they sell out. To sweeten the pot (the boiling pot that is), we're teaming up with Moon Grove Farm (a new farm B&B) to offer out-of-town guests special rates for the July 21st Farm Dinner. Check out their deals. The farm is gorgeous in the summer, there usually is a breeze and it’s a magical place to enjoy a hyper-local farm-to-table meal. Posted 7/5/2018 6:42pm by Leslie Cooperband or Wes Jarrell. I put on a mindset for working in extreme heat. I tell my mind that I like to sweat, that sweating is nature’s air conditioning. I wear my drenched clothing like a badge of honor; a testament to the work accomplished. The normally simple tasks of feeding the goats, dumping out and cleaning the water troughs, sorting out the hay stems and replenishing their hay rarely provoke a dampened brow under “normal weather conditions. When the early morning temperatures are already above 75 degrees, and the mercury is soaring toward the mid 90’s, I am resigned to my face flushed and dripping at the onset of chores. I convince myself that, as the days of high heat & humidity accumulate, my body has adapted, and my endurance becomes more bearable. Once covered in sweat, I rationalize that is easier to just stay outside and continue to work. Why not pull a few weeds in the garden, harvest some raspberries or check on the ripening tomatoes? Soon, it will be time to check the water troughs again and make sure the fans are working in the barns. The goats do not sweat, so they pant, like dogs. It turns out that conformation (how their bodies are put together) matters when it comes to susceptibility to heat stress. I have noticed that the stockier does (mostly La Mancha and La Mancha crosses) with large heads and short necks are the first to pant or park themselves in front of the fans in the barn. Their earless character does them no favors either. The Nubians lose heat through their long floppy ears, a remnant adaptation from their north African heritage. The long-necked Nubians seem almost unfazed by the extreme heat. They gallop to the prairie for browsing after the morning milking, and resist the signal to head back to the barn when the herder says it’s time to go. The herder squirts cold water from his/her water gun into the mouths of those does who solicit a cold drink. The heat stressed does welcome a dousing from the water hose, their normal revulsive reflex at getting wet overridden by their desire to get cool. I have come to realize that those who have grown up in climates with dry summers have lower tolerance of what we affectionately call “the heat index.” It’s the combination of heat and humidity that fights with the body’s attempts at evaporative cooling. Wes, having grown up in the Pacific Northwest, describes this weather as suffocating. He claims a feeling of drowning under the heat and humidity. While I too desire the reprieve of an air-conditioned house, my childhood of hot & humid east-coast city summers with no air conditioning have primed my body to persevere. Text Message Customer Loyalty Program: This week’s market special involves another one of our cheese & beer experiments. We’re pretty pleased with how this little washed rind cheese turned out. To get the message with the special info, you’ll need to sign up: text either “GOAT” or “URBANA” or “FARMSTORE” to 30500 to sign up. If you’ve decided to take a holiday from the heat of the kitchen, why not grab a few of our cheeses and make a simple cheese board to enjoy on your deck or patio (or even in the luxury of your air-conditioned home). If you want to fancy it up, here’s a really simple fig-chevre recipe. Believe it or not, you can find locally grown fresh figs at the Urbana Farmers’ Market (Cary’s Garden has them if you get there early). Little Bloom on the Prairie: This batch is perfectly ripe this weekend. Try grilling it for a few minutes. Then, serve with a local honey or a tart jam. Angel Food: our little “mini-brie” or crottin style bloomy rind; this batch of Angel Food is firm and tangy. It could be sliced into rounds, lightly breaded and pan-fried for topping a bed of fresh greens. Black Goat: an ash-coated bloomy with a delicate and crinkly yeasty rind. This batch is ripening nicely, and it has a sublime fudgy consistency and a hint of yeastiness on the rind. Try pairing with spicy dry-cured salami. Gelato: Flavors of gelato pints are limited for this weekend. I encourage you to bring a cooler with ice packs to the market to keep your gelato in tip top shape as you travel from the market to your home. Now through the end of August, we are open Wednesdays-Fridays, 3-7 pm, as well as Saturdays and Sundays, 1-4 pm. The farm is a tranquil green space where you can come after work to unwind. During our open hours, you can savor a scoop of gelato or “build your own” cheese boards—pick out your cheeses, add a salami (Underground Meats) or jar of jam from Autumn Berry Inspired or pickled veggies, grab some Lucky Pierre bagel chips and we’ll provide the board. You can sit outside under our new pavilion roof and enjoy a glass of wine or beer with cheese! We have lots of shades spots to get you out of the hot sun. Want to go the total sweet route? How about a root-beer float with a scoop of our gelato? De-stress by visiting with the goats. They love to be petted, even in the warm weather. Shop in our farm store “The Real Stand.” We’ve got pasture-raised meats and poultry from Bane Family Meats, frozen artisan sausages from Piemonte Sausage Co., pickled veggies and pestos by Sarah (our former gelato maker), locally-grown and milled flours by The Mill at Janie’s Farm and much more. July 12th, 5-7 pm “Wine Tasting with Michael” We’ll be featuring some refreshing Italian whites—Costamolino from Sardinia, a Venetian Pino Grigio and a rose (Sera Lori) from Sardinia. We’ll uncork a few bottles of Spanish Cava too. Michael is informative and lots of fun. You won’t want to miss this one. $10 for the tasting; all wines are $7/glass. July 12th, 6-8 pm “Weed Dating at Delight Flower Farm” The Land Connection’s popular event for singles who like to get dirty is back. We are co-hosting the event with TLC and Delight Flower Farm. Take a break from pulling weeds and do our wine tasting while you're here. July 14th, 5-7 pm Delight Flower Farm Open House and Guided Tours Delight Flower Farm rents land from us, and they are opening their space up to show folks all the beautiful flowers they are growing. Reservations required. We are keeping our farm store open that night so visitors can shop in our farm store or grab a cheese board and a glass of wine or beer. Farm Dinners: There are still plenty of seats for our “Southern Style Seafood Boil”, our “Cheesy Affair” and our “Summer Vegetarian” farm dinners. The menus will be posted soon, but I encourage you to book your tickets now, before they sell out. The farm is gorgeous in the summer, there usually is a breeze and it’s a magical place to enjoy a hyper-local farm-to-table meal. To sweeten the pot (the boiling pot that is), we're teaming up with Moon Grove Farm (a new farm B&B) to offer out-of-town guests special rates for the July 21st Farm Dinner. Check out their deals. Posted 6/29/2018 10:17am by Leslie Cooperband or Wes Jarrell. This past week, while one of our cheese makers was on vacation, I stepped back into the daily routines of making cheese. The singular focus on transforming milk to curds and whey was a welcome respite from my current routine of juggling five or six disparate tasks aimed at keeping the farm afloat. The seemingly tedious tasks of setting up vats, transferring milk, ladling curds, washing dishes, washing tomme-style cheeses and scrubbing floors provide dignity and a sense of accomplishment. A typical day in our creamery starts sometime between 7:00-7:30 in the morning. Our head cheese maker, Lynn, has already worked out the hard part of juggling cheese make schedules, so we know our general game plan at the day’s onset. The first person in the creamery goes through the opening procedures of checking room temperatures and humidity levels, making sure all of the equipment is working, preparing sanitizer for use throughout the day and cleaning work surfaces. Then, we set up the cheese vat to receive milk, and the milk is slowly pumped from the bulk tank. There is a bit of art in the simple act of transferring milk. The trick is to engage the pump just enough to get the milk to flow slowly, but not too fast so the milk gushes. Goat milk fats and proteins are fragile, and when the milk is overly agitated, the disruption of fats and proteins can produce off flavors. Milk is the perfect medium for growing microbes, both good and bad. Cleaning all of the places where milk flows is an integral part to running a successful farmstead creamery. There is a very prescribed, multi-step procedure to ensure that no traces of milk or milk components remain on stainless steel surfaces. A creamery is no place for a cavalier dish washer. To the contrary, those who thrive as cheesemakers have borderline obsessive-compulsive tendencies. The ebb and flow of the day vacillates from time sensitive tasks (culturing, renneting, cutting curd, ladling curd) to those that need to be done by the end of the day (packing chevre, wrapping cheeses, washing tommes, cleaning aging rooms, washing dishes). Full immersion in the quotidian tasks of moving milk, cleaning and tending to the aging cheeses provides time for the mind to wander. It provides time for sleuthing as well. Most of the greatest joys and frustrations of running a small, farmstead creamery relate to the changes of the seasons, and really the daily changes in milk. As the more routine tasks are mastered, the cheese makers’ obsessions relate to understanding how the milk “behaves” in and out of the cheese vat, and following the threads that might explain differences from batch to batch. The duality of milk and environment in flux and constancy of routine are what fuel the cheese maker and what substantiate the sense of a job well done. This week’s market special involves two limited offering special cheeses. To get the message with the special info, you’ll need to sign up: text either “GOAT” or “URBANA” or “FARMSTORE” to 30500 to sign up. Next Wednesday is the 4th of July, so why not come to the market this Saturday to stock up on picnic staples (cheese & gelato in my book). We have a couple of special cheeses for you this weekend. We’ve also got some new gelato flavors you need to try. It’s going to be VERY hot this weekend, so come early to the market to beat the heat and get the best selections. Fresh chevre: plain, herbs de Provence, cracked pepper—so versatile, so delicious. Put it on everything you can find from the market this weekend. Fresh ricotta: Our Italian basket-style goats’ milk ricotta is delicate and mild. It’s the perfect foil for fresh berries and local honey or a quick summer pasta of grilled summer squash and mushrooms. Very limited offering, so come early to the market. Goat Milk Feta: Summer is “feta season!” We are now making our feta with pasteurized milk. It’s still aged in whey brine, imparting all the wonderful complex flavors you’ve come to expect from our feta. With salad season upon us (and soon the arrival of sweet corn), creamy-crumbly feta is in order. Little Bloom on the Prairie: This batch is almost perfectly ripe this weekend. Try grilling it for a few minutes. Then, serve with a local honey or a tart jam. Market Special: APPLEWOOD-SMOKED MOONGLO: Our friends at Black Dog Smoke & Ale House graciously smoked a few wheels of our Moonglo with Applewood chips. The result: a deliciously smoky firm and complex cheese. We think it’s pretty great, and it pairs well with sliced fruit—try it with first of the season market peaches. Very limited offering, so come early. Now through the end of August, we are open Wednesdays-Fridays, 3-7 pm, as well as Saturdays and Sundays, 1-4 pm. The farm is a tranquil green space where you can come after work to unwind. During our open hours, you can “build your own” cheese boards—pick out your cheeses, add a salami (Underground Meats) or jar of jam or pickled veggies, grab some Lucky Pierre bagel chips and we’ll provide the board. You can sit outside under our new pavilion roof and enjoy a glass of wine or beer with cheese! We have lots of shades spots to get you out of the hot sun. NOTE: For Wednesday, July 4th we will be open from 3-6 pm to give folks time to get to fireworks. Check out the new products by Sarah Stewart (our former gelato maker); pickled ramps, pickled shitake mushrooms, pickled yellow summer squash, fermented green garlic in brine and spring pestos (frozen--green garlic-pistachio and wild ramp). Mark your calendars for our next summer “Wine Tasting with Michael” event—Thursday, July 12th, 5-7 pm. Michael will be pouring a few featured wines from our portfolio of organic and biodynamic wines. We’ll feature a lovely white and a rose from Sardinia, a Spanish Cava (bubbly), as well as a few lighter reds that pair well with our bloomy rind cheeses. Dinners on the Farm: Our 2018 season is underway and guests are enjoying fabulous meals served under the roof of our new pavilion. Summer is a great time to enjoy dining outside at the farm. We have some fantastic themes for summer “A Southern Style Seafood Boil,” “A Cheesy Affair” (with guest chef from Pastoral Appellation Wine Bar) and “Summer Vegetarian” (with guest chef Dan Compton of Vie Restaurant). Hurry; tickets are going fast. Plan a get-away weekend in Central IL this summer: If you’re thinking about coming to one of our farm dinners this summer (or fall for that matter), and you’re coming from far away, why not make a weekend of it? We are partnering with Moon Grove Farm, a new farm B&B located in Mahomet (only 20-25 minutes’ drive west of our farm) to offer a special package deal with our July 21st Southern Style Seafood Boil Dinner. Stay tuned for details. Do you dream of having goats in your life? Do you want a family milk goat? How about for brush control or rural pet? Goats are wonderful working animals and affectionate companions too. We have great breeding stock with excellent health and milk records. We have doelings for future milking. We also have retired does, bucklings and wethers for grazing/brush control and companion animal needs. Check out what's available (we have pictures on our Facebook page) and contact us if interested. Posted 6/21/2018 9:52pm by Leslie Cooperband or Wes Jarrell. Today is the vernal equinox, the summer solstice, the longest day of the year in the northern hemisphere. Our skies have been prematurely darkened by waves of water-laden thunder clouds. Their billowy blackness could easily be confused with mountain peaks if it weren’t for the fact that you can see the storms rolling in from miles away. We need the rain, some of it anyway. The recent deluges have fueled an explosion of growth in the garden. Everything is germinating or flowering or setting fruit. We already have baby peppers and green tomatoes. 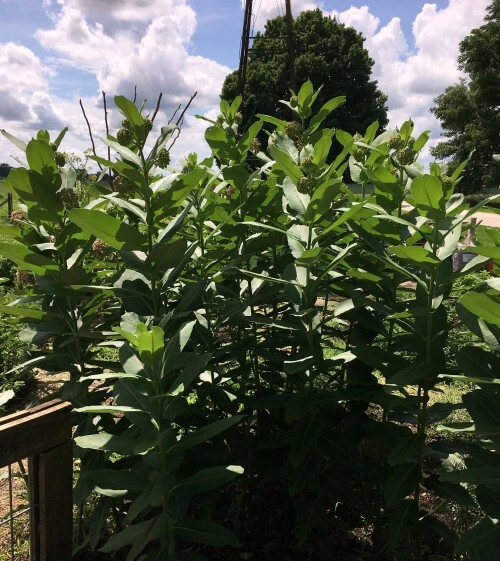 I’ve let the native milkweeds take hold in the herb garden these past couple of years, and this year they have become a little “milkweed forest.” Their strong thick stems tower toward the sun, supporting audacious pink flower clusters. Their scent is intoxicating, attracting a gaudy band of insects, dappled in alerting oranges and reds to signal the toxic brew coursing through their bodies. The milkweed forest beckons the female monarch butterflies. We have watched them circle the patch, taking stock of the quality of the leaves. Signaling their approval, they flutter and hover around the leaves’ undersides, in search of the perfect spot to lay their eggs. Soon, there will be baby monarch caterpillars taking bites out of our milkweed forest. I will allow them to selectively harvest the forest so they will grow. Eventually they will spin their chrysalises to become the butterflies that will migrate south. 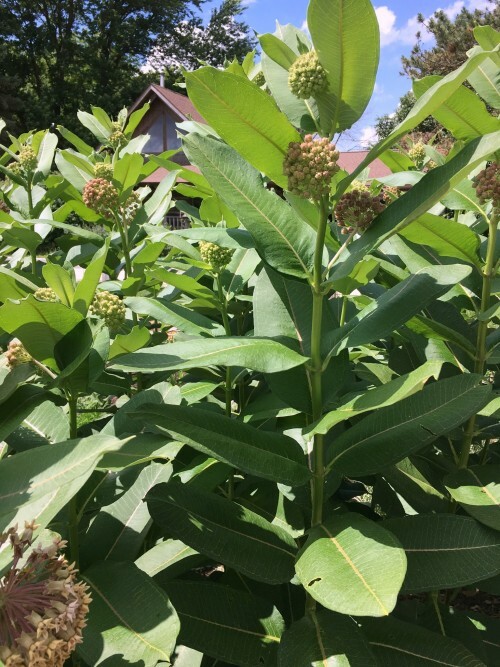 Their offspring, in turn, will return to our farm, to our little milkweed forest, to repeat the cycle and perpetuate their ties to our prairie landscape. This week’s market special involves black goat and beer. To get the message with the special info, you’ll need to sign up: text either “GOAT” or “URBANA” or “FARMSTORE” to 30500 to sign up. All three bloomies-Angel Food, little bloom on the prairie and black goat-- are plentiful and slightly young this week. Try some of our feta or fresh chevre on a market greens salad this week or grab some of our discounted Moonglo wedges. Little Bloom on the Prairie: This batch is young but headed in a very good direction. Try warming it slightly in the oven or over the grill for 5-10 minutes. Then, serve with a local honey or a tart jam. Angel Food: our little “mini-brie” or crottin style bloomy rind; this new batch of Angel Food is firm and tangy. It could be sliced into rounds, lightly breaded and pan-fried for topping a bed of fresh greens. Black Goat: an ash-coated bloomy with a delicate and crinkly yeasty rind. This batch is young, ripening nicely, and it has a sublime fudgy consistency and a hint of yeastiness on the rind. Try pairing with spicy dry-cured salami. Moonglo: fall-milk, tomme-style cheese; the texture of this semi-hard cheese is soft and supple like Gouda, but the taste is sharp and fruity. Ask for a taste if you’ve never had it before. Try it on crusty bread with onion jam or caramelized onions. Try melting it for a gourmet grilled cheese. Again this week, we have a batch with soft rinds, so we’re running a special--$5/lb. off the regular price. Ask for a taste—all you have to do is cut off the rind, and enjoy the delicious cheese within. Farm Store Summer Hours Now through the end of August, we are open Wednesdays-Fridays, 3-7 pm, as well as Saturdays and Sundays, 1-4 pm. The farm is a tranquil green space where you can come after work to unwind. During our open hours, you can “build your own” cheese boards—pick out your cheeses, add a salami or jar of jam or pickled veggies, grab some Lucky Pierre bagel chips and we’ll provide the board. You can sit outside under our new pavilion roof and enjoy a glass of wine or beer with cheese! NOTE: This Friday, June 22nd, we will be closing early (6:00 pm) because we have a private event at the farm. If you just want to come out to do a little shopping in farm store, we’ll have cheese and scoops of gelato as well as other farmer products: locally milled whole wheat flour from The Mill at Janie’s Farm, meats, poultry eggs from Bane Family Meats, Piemonte Sausages and Jams from Autumn Berry Inspired and Prairie Fruits Farm “merch.” Check out the new products by Sarah Stewart (our former gelato maker); pickled ramps, pickled shitake mushrooms, fermented green garlic in brine and spring pestos (green garlic-pistachio and wild ramp). Mark your calendars for our next summer “Wine Tasting with Michael” event—Thursday, July 12th, 5-7 pm. Michael will be pouring a few featured wines from our portfolio of organic and biodynamic wines. We’ll feature a lovely white and a rose from Sardinia as well as a few lighter reds that pair well with our bloomy rind cheeses. Dinners on the Farm: Our 2018 season is underway. Summer is a great time to enjoy dining outside at the farm, especially under our new timber-frame pavilion. We have some fantastic themes for summer “A Southern Style Seafood Boil,” “A Cheesy Affair” (with guest chef from Pastoral Appellation Wine Bar) and “Summer Vegetarian” (with guest chef Dan Compton of Vie Restaurant). Hurry; tickets are going fast. Plan a get-away weekend in Central IL this summer: If you’re thinking about coming to one of our farm dinners this summer (or fall for that matter), and you’re coming from far away, why not make a weekend of it? We are partnering with Moon Grove Farm, a new farm B&B located in Mahomet (only 20-25 minutes’ drive west of our farm) to offer a special package deal. Stay tuned for details. Do you dream of having goats in your life? Do you want a family milk goat? How about for brush control or rural pet? Goats are wonderful working animals and affectionate companions too. We have great breeding stock with excellent health and milk records. We have several does that are bred and due to kid in mid-July as well as a couple of milkers. We also have retired does, bucklings and wethers for grazing/brush control and companion animal needs. Check out what's available (see pictures on our Facebook page) and contact us if interested. Posted 6/14/2018 8:51pm by Leslie Cooperband or Wes Jarrell. The US dairy industry has designated June as “National Dairy Month.” I am not one to jump frivolously on a seemingly trite industry marketing campaign, but we are in the milk business, after all. We have an intimate relationship with milk, as well as the animals who provide us with the white fluid richness. For us, our goats’ varying diet, their health and their overall well-being are seamlessly linked to their milk, both quantity and quality. As a farmstead creamery (we use only the milk from our herd of goats to make our cheeses), our relationships with goats and milk are especially acute and intense. Our milk and dairy products are like a symphony: the goats are the musicians, the pasture their theater and milkers and cheese makers the rotating conductors. Consumption of animal milk is in trouble. According a recent study of milk consumption trends over the past couple of years (I get a lot of great information about the commercial dairy industry from a weekly newspaper called “The Cheese Reporter”), more people are choosing non-animal (soy, almond) “milks” over animal dairy products. The report cites health problems (allergies, lactose intolerance), dietary lifestyle choices (veganism) and environmental and animal welfare concerns as some of the reasons for this trend. There are so many unconnected pieces to this puzzle of why we choose to eat/drink what we do, it would take many arrows and boxes to begin to develop a coherent explanation. The fall from designation as “nature’s perfect food” to gustatory pariah has been gradual, complex and somewhat stealth. There are many myths and mis-perceptions about dairy farming and milk that have contributed to milk consumption’s demise. In talking with folks who visit our farm, I find many don’t appreciate the necessity of mammal’s having offspring to produce milk. Milk is available year-round and ubiquitous, so the connection to a life-cycle or a season is muddled. Since we are a seasonal dairy and most of our does kid in the spring, it is easier to demonstrate this connection. The greater nuances imparted to milk from animal type, animal breeds, stages of lactation or diets (forages versus grains, silage versus fresh pasture, for example) make the choices of what to drink or eat even more complicated. Some folks believe they are lactose intolerant, yet can consume dairy products made with goats’ milk with ease. This apparent paradox highlights the different types of milk proteins in cow versus goat milk. Most adverse reactions are likely allergies to cow milk proteins. Many doctors tell their patients to avoid dairy products all together; other doctors tell expectant mothers to avoid certain types of cheese, even if they’re made with pasteurized milk. Milk can be confusing, and does not conform to one-size-fits-all dietary guidelines. Small-scale, family-owned dairy farms are becoming endangered species as well. Every year, there are fewer dairy farmers milking 100 cows or less. Most live in a commodity landscape in which it costs more to produce a gallon of milk than they receive in payment for that milk. Consumers celebrate $2/gallon milk at the grocery store, while dairy cooperatives send suicide prevention letters to dairy farmers with their milk checks. Even organic milk producers are being given the squeeze from processors; some processors will only take so many gallons per farm. So, what does it mean to celebrate milk and dairy products in our modern world? For me, it’s more than just drinking a glass of milk or eating a piece of cheese. It’s a call to know your dairy farmers. It’s a call to probe your milk’s origins, to understand what how the animals are cared for or how their diet and living conditions affect their milk quality. Embrace the complexity of nature’s perfect food. In celebration of June Dairy Month, we have a special offer for our farm store patrons. To get the message with the special info, you’ll need to sign up: text either “GOAT” or “URBANA” or “FARMSTORE” to 30500 to sign up. All three bloomies are plentiful this week—black goat and little bloom are perfectly ripe, while angel food is still young but tasty. Try some of our feta on a market greens salad this week or grab some of our discounted Moonglo wedges. In a large salad bowl, fold together all the ingredients until mixed well. Make sure chickpeas and strawberries are evenly coated. Cover bowl and chill at least one hour before serving. Serves 6 approx. 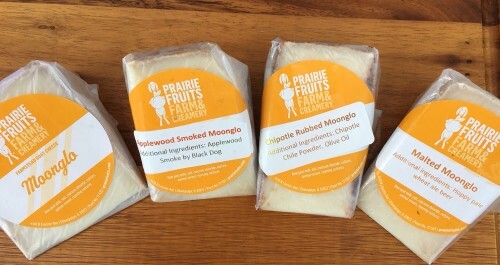 Note from Prairie Fruits Farm: I haven’t tried this recipe yet, but it’s simple and it sounds delicious. If you don’t want the spicy, omit the jalapeño pepper. You might also add a little (1 T) chopped, fresh mint. Season with salt and pepper as needed. Goat Milk Feta: the first of the season feta is HERE! We are now making our feta with pasteurized milk. It’s still aged in whey brine, imparting all the wonderful complex flavors you’ve come to expect from our feta. With summer salad season upon, the arrival of our feta is timely. We will have limited quantities of our feta in olive oil with herbs too. Little Bloom on the Prairie: This batch is perfectly ripe. Serve with local honey or one of the jams in our farm store. If you want to go the savory route, try serving a round with one of our new spring pestos—wild ramp or green garlic or fermented green garlic in brine (found only in the freezer section of our farm store). Angel Food: our little “mini-brie” or crottin style bloomy rind; this new batch of Angel Food is young, firm and tangy. For those you who like it slightly tart and crumbly, this is your cheese this week. Black Goat: an ash-coated bloomy with a delicate and crinkly yeasty rind. This batch is ripening nicely, but it has a sublime fudgy consistency and a hint of yeastiness on the rind. Try pairing with spicy dry-cured salami. The farm’s summer hours have begun; now through the end of August, we are open Wednesdays-Fridays, 3-7 pm, as well as Saturdays and Sundays, 1-4 pm. The farm is a tranquil green space where you can come after work to unwind. During our open hours, you can “build your own” cheese boards—pick out your cheeses, add a salami or jar of jam or pickled veggies, grab some Lucky Pierre bagel chips and we’ll provide the board. You can sit outside under our new pavilion roof and enjoy a glass of wine or beer with cheese! Dinners on the Farm: Our 2018 season is underway. Summer is a great time to enjoy dining outside at the farm, especially under our new timber-frame pavilion. We have some fantastic themes for summer—“Summer Tapas,” “A Southern Style Seafood Boil,” “A Cheesy Affair” (with guest from Pastoral Appellation Wine Bar) and “Summer Vegetarian” (with guest chef Dan Compton of Vie Restaurant). Hurry; tickets are going fast. Do you dream of having goats in your life? Do you want a family milk goat? How about for brush control or rural pet? Goats are wonderful working animals and affectionate companions too. We have great breeding stock with excellent health and milk records. We have several does that are bred and due to kid in mid-July as well as a couple of milkers. We also have retired does, bucklings and wethers for grazing/brush control and companion animal needs. Check out what's available and contact us if interested.